So! Summer has been busy and I haven’t posted for a while. It’s been 6 months since I made a start with the blog and I’ve already made contact with a couple of awesome cousins! Turns out I’m not the only one puzzled by Maria Harcour! Maria was born in Bombay in 1811 and married a shrimper from Margate in 1829. We haven’t been able to find a birth certificate for Maria and know nothing of her siblings or parents. 3. Christiana Edwards, age 10, female, born in the county. I think the mark in the employment column is F.S meaning (female servant). 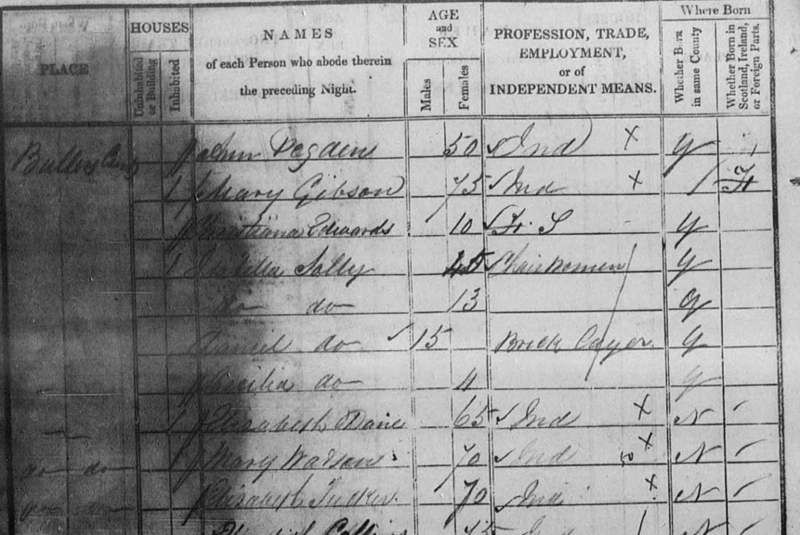 I wonder if Mary Gibson could be Marias widowed mother seeing as Maria named her first born Mary and Mary Gibson was also noted as born in foreign parts on the census? Perhaps Ann Peg(d? )ine is Marias older widowed sister? Maria gave 3 of her girls the middle name of Ann so the name must have been important to her. Or perhaps its just a coincidence and Mary Christiana is the servant not a family member? Double strokes // are used to indicate the end of the list of people living in a dwelling, single / ones are used to divide different households sharing the dwelling. It looks like Ann and Mary are living in one dwelling and Christiana is noted as same dwelling different household? So I think this would suggest she is not part of the family? The house is ‘Bullers Court’ Margate. Family Search says the address is ‘High St Buller’s Court’ and is an institution. In 1793, John Lewis (a historian) stated that Buller’s Court was often referred to as the ‘Parish Yard’ and was used as a refuge for old ladies. …..off to do some more research! This entry was posted in Edwards, Harcour, Surnames and tagged Bullers Court, Edwards, Harcour, Margate on 29th September 2015 by admin.